With its 120 km of gorgeous coastline and warm and sunny weather, the Algarve is the perfect destination for a family holiday. All along the coastline, with its stunning beaches and scenic rock formations, several resort towns offer everything the family could need in the way of fun in the sun for both parents and kids. Family-friendly hotels and well-equipped self-catering accommodation make visitors feel at home, while the many restaurants, shops and cafes of the Algarve towns offer the best for a family holiday in Portugal. One of the recommended destinations for families is lively and fun Albufeira. Once a tiny fishing village, Albufeira has grown to become the largest of the resort towns on the southern Portugal coast, offering a gorgeous beach and a great selection of both restaurants and nightlife to suit all. There are more than 25 beaches to enjoy on the Albufeira coastline, including Praia dos Peascadores (Fisherman's Beach), close to the Old Town with its many restaurants and popular water sport activities. While lacking in many of the usual facilities, Praia do Barranco das Belharucas is a quieter spot away from the busier areas. One of the most popular beaches is Praia da Falesia, with its 5 km of sand, perfect to let the kids run and have fun. Some areas of this beach do offer restaurant facilities and water sports. Albufeira is not just about the beach, however, as the Old Town makes a fascinating place to explore with its narrow, cobbled streets and quaint souvenir shops. There are also many restaurants and cafes, offering traditional cuisine, as well as dishes from all over the world. In fact, it is estimated that there are more than 160 different eating establishments in Albufeira, offering a huge choice for every meal. For adults, an area of the Old Town dubbed “the strip” offers endless bars and nightclubs, perfect for partying the night away. The area also offers world-class golf courses for the avid golfer to enjoy. While a bucket and spade are the ideal choice for small children, older kids and teenagers will probably want more activity. While Albufeira has no theme or water parks itself, there are regular shuttle buses to all the most popular parks along the Algarve coastline. Take a bus to Zoomarine in Guia for a great day out, enjoying a combination of fun water park and aquarium offering dolphin displays. For those who enjoy the more extreme water rides, try Slide and Splash in nearby Lagoa, with its amazing flumes, slides and rides. Close to Albufeira, the family can visit the 12th-century Castle of Paderne. This well-preserved building was built by the Berbers in the late 12th century and is around 8 km from the centre of town. 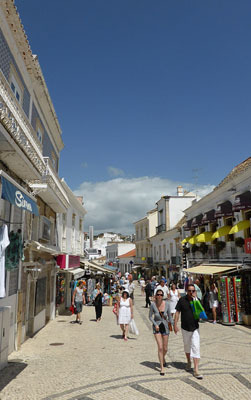 Albufeira is easy to access from Faro Airport, 40 km east of town. The low cost airlines regularly fly into Faro and the airport offers connections to all the popular destinations in Europe. There is little in the way of public transport between Faro airport and Albufeira, and a journey would involve two separate buses. Most families prefer to either rent a car or pre-book a transfer from the airport to town.